What the State has done so far is to record all the properties that it owns in order to exploit some of them. So far that means nothing and as far as I know there has not been any interest to buy or exploit Golden Beach. That would be impossible anyhow. All Thassians and not only, are against any such development and I am sure nobody will dare to go ahead with such an investment. The meetings and rallies were only a warning to the State and investors to be, not to dare go ahead. I am sure that anybody who would be interested would have second thoughts bearing in mind that Thassians did not allow the radar to work on Ipsario although it was installed and supported by NATO. Nobody will be able to put a single column to prevent the people from going to the beach. That is a guarantee. Today, 19/7/2013, an engineer from the State came to pick up the titles of the properties under State ownership, including those of Golden Beach. People from everywhere on Thassos gathered in front of the Town Hall and did not allow him to get the papers and have decided to remain there to prevent any other state official who tries to do the same. After the engineer gave up and left, there was a procession of the people towards the harbor where they put up the sign you see. They are determined not to allow any sale of State Properties that go against the interests of the locals and our visitors to materialize. It is also a warning to any investor to not consider such a purchase. He would lose all his money. I do not understand what that last part means. What is a mild regeneration? As for your question, we'll see what that means. I'm sure we'll be finding out more in the coming days. 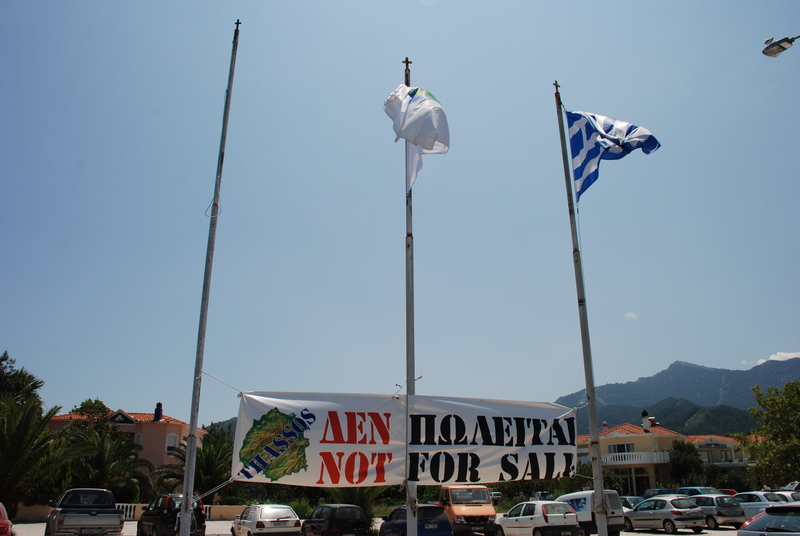 The Mayor of Thassos is supporting the people of Thassos on this 100%. He was ahead of today's rally and what probably he means is that they will try to develop the camping and generally the whole Golden Beach and all the rest of the State properties according to the needs and interests of its citizen. I will keep you posted for whatever happens as far as this matter is concerned. evxaristw gregory! immediately i have one of my favorite songs in mind: "afto to choma einai diko tous kai dikomas!"